During my stay in Britain, we undertook many literary pilgrimages. One of them, of course, was to Stratford-upon-Avon, Shakespeare's birthplace. There were many exhibits about the lifestyle of the people during the Tudor period, and about Shakespeare's life and work. It was a peek into much that was extraordinary about the Bard, as well as much that was ordinary. It was a memorable visit, and I can still see the Avon river after so many years. 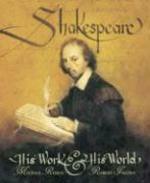 I have earlier reviewed Shakespeares Storybook : Folk-tales that inspired the Bard during CROCUS 2010 at Saffrontree. A book about the indigenous folk-tales that he took inspiration from, and re-shaped them to write his own plays, in the context of the society he lived in. Here are some more books. We have here a whole group of interesting characters who have set up a weekend village market. We have Mr Rummage who has a curio shop, full of knick-knacks of all kinds. 7-yr old Digby and his 9-yr old sister Hester frequent the market every Saturday and learn a lot about the things they find there from the knowledgeable Mr Rummage and the others. This is whole series of books, with biographies of greats like Mozart, Mahatma Gandhi, Martin Luther King, etc. We are looking here at the Bard's. In our current book, they come across a goose-feather quill, that Mr Rummage claims to have been the property of William Shakespeare. This starts a discussion about the Bard. They speak about his childhood, where he had to keep very long and taxing school hours. About his youth, when he married early, at 18, to Anne Hathaway, who at the time was 26 yrs old. About the 'lost years', a long period during which his life is not accounted for. About his joining court as the Queen's jester, and then going on to better things on stage. To the good, the bad and the ugly of his life as a player. About the Globe theatre. There are a lot of side-notes and pictures- actual paintings from Shakespeare's time that make for informative reading. A good way to introduce the Bard's life to young children. A thumbs-up given by A. The times Shakespeare lived in, were exciting times for Europe. The world was just beginning to emerge from what have been called 'the Dark Ages.' People travelled more, discovered and learnt about more of the world. Renaissance had spread to Elizabethan England from mainland Europe, but it was a yet a dangerous world. People still stood more of a chance of dying a violent death or of illness, but there were now advances in science, literature, arts and craft that reached a new high. Theatre, too was coming out of its earlier adherence to performances based on biblical stories, and for the first time, social themes were being tackled, the Bard spearheading this movement. There had been, of course storytellers that travelled from place to place, but never had there been plays on such a large scale. The patrons were, of course royalty, so they featured in many of the plays. Michael Rosen has given us a book that brings alive all this excitement, associating the phases of his life to parts from his work. In the process, he has elevated Shakespeare from a school-child's perception of it as "Oh, no, so boring!" to something they will be drawn towards. He has taken some of the more well-known plays and deconstructed them to show the relevance to contemporary life- something that these students can identify with, without detracting from their original beauty. And therein lies the success of this book. Full page, and sometimes double spread illustrations in sepia tones by the Hans Christian Anderson award winner Robert Ingpen add an essential visual element to Rosen's work. life, seven years from his marriage to the time when he surfaced as a player at the royal court, and also the controversies over the Bard's true authorship of his plays. 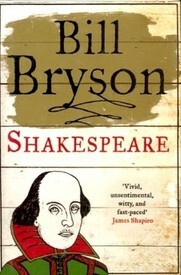 As with all Bryson's books, this is an excellently researched volume, written converstionally- it makes for great reading aloud, and is ideal for young adult and adult Shakespeare aficionados. No discussion on Shakespeare is complete without speaking of the Globe Theatre- the site of many of the Bard's plays, at which he himself took part. When I was a high school student, our English teacher had somehow sourced a kit which had cut-outs we could press out, and construct the Globe theatre in great detail, which our class then proudly exhibited during open house. 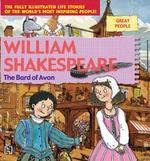 It is one of my cherished memories of school life, and has played a great part in my interest in the Bard's work. Illustrations play a large part in this book, which gives us details about the life in Elizabethan England, the everyday life and the life of royalty. The cover page shown here gives an idea of the details that follow. The advent of theatre and plays, the life of those involved. 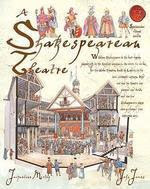 The building of the Globe theatre in 1598 in Shakespeare's heyday, its interiors and the way it was used during the performances. The burning down of the theatre in an accidental fire in 1613, and the re-building of it in 1614, just two years before Shakespeare's death in 1616. Awesome, bookmarked and thanks mucho for lending us the last one! Sandhya, as usual a lovely post.